This is a guest post from Ms. Savita Hiremath, Green Committee Member of Sobha Azalea & Althea, an apartment complex in Yelahanka, Bangalore. Sobha Azalea & Althea owners association have been using ApnaComplex for last 1.5+ years to manage thier society’s operations and finances. At Sobha Althea & Azalea, we are a motley group of women coming from various backgrounds. 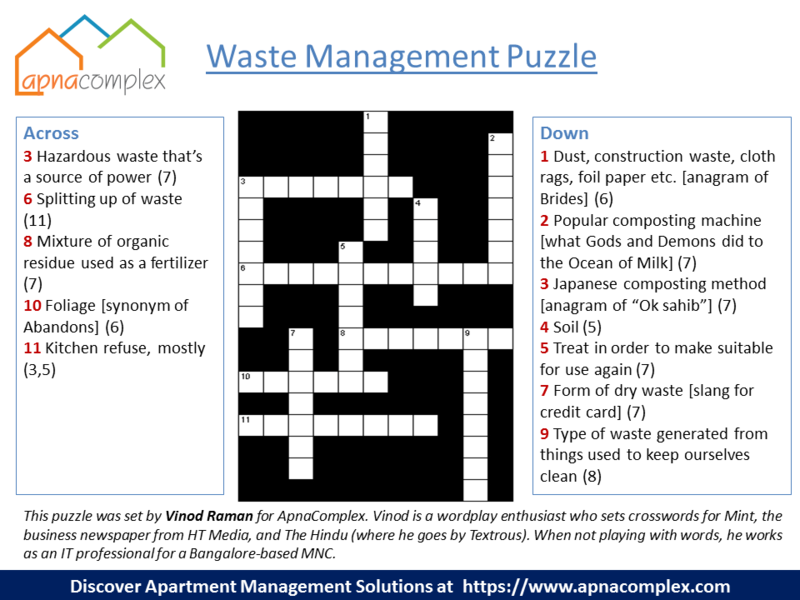 We were thinking of putting a waste management system in place even before the BBMP legislation came into force. But for some reasons, it didn’t take off. The legislation was just the kind of nudge we needed to get going and start thinking about HOWs and WHYs. A string of meetings helped us frame certain guidelines for our own residential community while keeping in mind the larger picture: A waste-free zone. 1. Get the Green Committee members together: This is the first step. If the GC members are not like-minded and united, then the community won’t give a hoot to your rules. In many cases, committees are either inactive or suffer from absenteeism. A couple of get-togethers can kick off unprecedented bonhomie and help focus on work. If each one gets complimented for the sincere work they do, team work becomes a pleasure and truly rewarding. 2. GC members must remain up-to-date with the developments. Be always a step ahead of others to reinforce your authority on the subject you are trying to handle. Power without authority on the subject cuts no ice. 3. Put necessary infrastructure in place. Labeled bins for storage and others for collection. Make sure housekeepers have safety equipment like gloves and masks. Tie up with agents for dry waste recycling. If you are going for community composting of wet waste, make sure the entire workforce is trained along with one or two GC members. 4. Prepare a Dos & Don’ts file on waste segregation before informing the community that the exercise will begin on a certain date. Let this be as comprehensive as it gets. Send the printed note to all the flats and secure their signatures to make sure that nobody feigns ignorance later. Put up notices on ApnaComplex, community’s Facebook page and spread the message through all other active email groups. 5. Train the Housekeepers first and keep the Facility Manager in the loop (training methodology given below). 6. Notices & reminders: Put up notices wherever possible. Create an atmosphere in community areas with colourful posters. Use ApnaComplex, Facebook, personal ids for spreading info on upcoming training sessions/meeting and also Dos & Don’ts. Create a sense of urgency so that people are pressured to attend the meetings. Do not reveal when the next session will be held. Warn of serious action if people fail to comply. 7. Invite residents to take part in the cause. Call these meetings “interactive sessions”, not “trainings”, as some residents may already know a lot about segregation and their knowledge/intelligence should not be underestimated. If the turnout isn’t good, persist and call for another session. 8. Build a relationship with every one Given the demographic makeup of Bangalore’s population, it’s a given that people come here from various places/speak various languages. In our complex, a good chunk of people flit in and out of India often and there’s a chance that they may miss out on the local socio-political developments. There are certain subtle contextual nuances that non-Kannadigas may not get. We all know how the mainstream English newspapers and TV channels focus more on news that caters to English-speaking people, quotes are gathered from those who can speak English. However, when it comes to dealing with issues like waste segregation which needs co-ordination with your maids and cooks (most of them speak local languages) day in and day out, developing a CONNECTION with them is a step taken in the right direction. 9. But first, build a backgrounder. In the meetings, brief the people on how it all began and where we are headed. 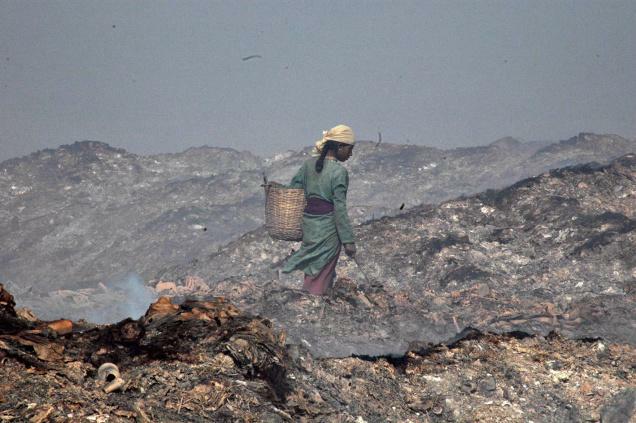 Tell them about how hellish life got for people in Mylappanahalli, Mavallipura and Mandur landfills. 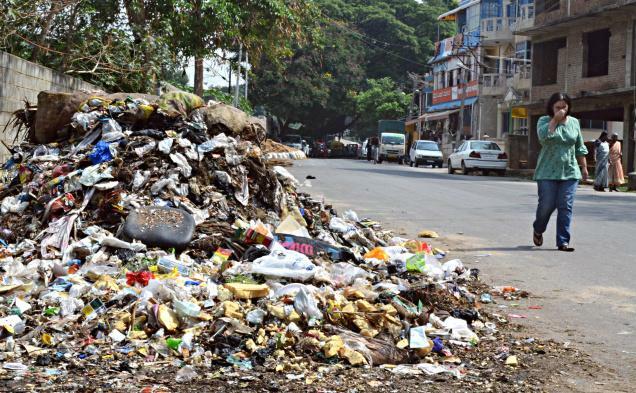 Most people may not know how BBMP dealt with tonnes of garbage all this while. Be prepared for such ‘revelations’. Once the backgrounder is laid bare, get down to specifics. 10. Be firm, yet flexible. To make anything work, there WILL BE and HAVE TO BE certain negotiables and non-negotiables. a. Everyone has to follow the BBMP law. No exceptions. No giving room to cynicism that no such law has ever worked and is bound to fail this time, too. Just say that we will go ahead even if the entire Bangalore fails to execute. Certain decisions (that affect the entire community) cannot be left to individual choices. b. No using plastic bags for lining the kitchen and dry waste bins. No question of giving leeway to anyone just because they are working men/women. Tell the residents not to tie the bags but empty their bins directly into the large mobile bins pushed by the housekeepers. This way, it’s easy to figure out if there’s any mixed waste and pinpoint the errors right on the spot. Many of our residents initially found this practice pretty cumbersome and “stinky”. We stuck to our guns and said that newspaper sheets lining will not leave solid leftovers/residue sticking to the bin and will be easy to wash. So far, so good! c. No saying ‘no’ to rinsing milk packets/food containers. Tell them that the dry waste agent comes only once in a fortnight and storing badly segregated waste in the basement means stench and of course, inviting rodents, houseflies, mosquitoes, etc. d. They must send ALL their maids/cooks/drivers for training. This became the highlight of our discussions because we had to explain how language barriers between the owners and maids/cooks can be exploited by either of them to commit errors. At the same time, tell the residents that it makes their job easier because the housemaids/cooks will sense how serious everyone is. NEGOTIABLES: a. It’s left to the residents if they want to line the kitchen bin with newspapers sheets or not. You can recommend a certain type of bin, but if they already have inbuilt modular bins, let them decide how they want to store and dispose of wet waste. b. Place bins near the lift entrance so that working men/women can dump the wet waste while they leave for work early in the morning. But do make sure that they don’t use plastic bags for this purpose. Luckily, our residents have found newspaper sheet lining pretty effective! c. If some residents want to train their own in-house maids/cooks, leave it to their discretion. But, if they make mistakes, make sure that you emphasize the need for training session and tell them that they must attend the next session. 11. Launch door-to-door campaigns immediately. This will reinforce the seriousness of the GC’s commitment to going green. Secondly, it gives a chance to know your neighbours better. And most importantly, their reaction to the whole thing will, in most cases, lets you figure out who has taken it seriously and who is likely to fall out of line. 12. Involve Everyone Invite more volunteers and appoint block co-ordinators. If necessary, floor co-ordinators, too. We have realized that selling dry waste fetches a decent amount of money. A part of it can be used to incentivise the housekeepers who deal with stink and dirt every day. Tell them it will all get mutually beneficial if the collective aim is achieved. Enforce punitive measures, if necessary. However, remember that the ultimate aim is NOT to punish people, but to achieve 100% compliance. For that, be ready for any number of trainings/monthly sessions as you move on. a. Once they attend the training, domestic helps cannot say they can’t do segregation. b. They cannot exploit the language barrier (if any) to go lax. c. If there is no language barrier, the seriousness with which the GC members proceed, fellow workers’ enthusiasm, or at least, willingness to participate in the cause, will put pressure on the rest. Explain the background. If you just say “put wet waste here and dry waste there”, they don’t see the value behind the exercise. You have to explain WHY it has to be done and WHAT will happen if we don’t follow the rules. It’s natural for domestic helps and cooks to think that we are stretching this segregation thing a bit too far and adding more burden to their already difficult lives. But if you tell them clearly that they are some other people—pourakarmikas—whose lives are even more difficult, they begin to CONNECT! This has been the case with our electricians, plumbers, security guards, drivers, gardeners, etc. Explain how we think everything that rots is “stinky”. We have to lay bare our own stupidity in front them and laugh at it and invite them to learn from our mistakes. They will begin to think educated people also make mistakes and are also learning just as they are. To think that they don’t get the larger picture of environmental health is a bit too condescending. If you get them to talk, you will know life has taught them a good deal. We have found that, if explained in simpler terms, they are able to get scientific details, too. 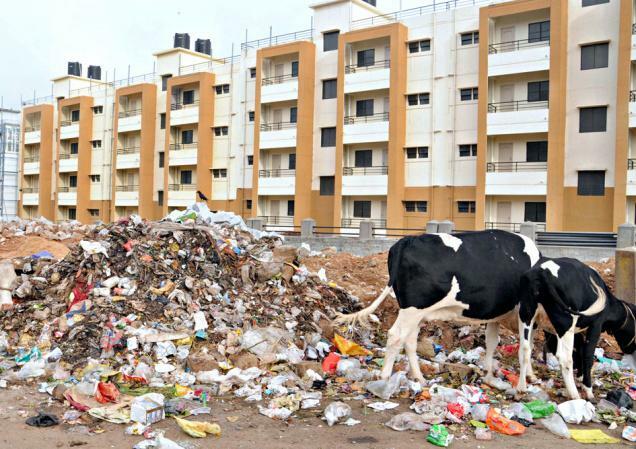 If they remain impassive/indifferent to rules on rinsing milk/food packets, collecting wet waste directly in a bin without lining, remind them that this is exactly what they are doing in their houses, too. Make sure that the entire workforce employed by an individual household attends the training. Otherwise, blame game starts in no time. We have experienced this. In a few cases, we saw some thinking residents sitting along with their maids in the training sessions. This in itself made the workforce realize how serious we all were and how we wanted the rest to be involved to make it a success. Nothing can work better than this! If we are serious, we don’t see why our maids can’t get serious. Ultimately, nothing much can be achieved if the helps/cooks do not co-operate. Let the residents decide how they want to reward them when they do a good job. Sometimes, just a compliment will go long way in achieving compliance. You may wonder why train electricians, plumbers, security guards, drivers, gardeners, etc. But we can’t do without their co-operation. They often dispose of waste after cleaning cars into wrong bins. Electricians dump e-waste just anywhere and so do plumbers. It’s essential that they know the basics of segregation as some of them eat lunch in the parking lots, smoke and drink tea, and throw the leftovers, beedis/cigarette butts and plastic tea cups just anywhere in the car parking areas. Paan/gutka stains and spitting into sand buckets are also issues that need immediate action. In short, anybody who enters the complex should know the rules in place. Follow the same method of explaining the backgrounder before talking about types of waste. Help them connect with your message. Be warm and receptive. Be ready to entertain their views and complaints. Talk beyond segregation and show them that you care for their welfare in general. Try to SINCERELY look into complaints if they have any. Once trust is established, it’s becomes relatively easier to enforce rules. As a closing remark – Remember it’s a marathon, not a sprint. You’d rather lose some battles on the way when you know you are out to win the war. Patience is of paramount importance! Savita is a Bangalore-based a journalist since 1995 and consults several NGOs and a human rights group to research and document socio-political issues. She has earlier worked with Deccan Herald, The Times of India, and The New Indian Express, and headed a journalism institute for an year. She loves to write on women’s issues, HIV/AIDS, caste and religion, rural poverty, environmental issues, and tennis. You can read more about her on her blog at www.savitahiremath.com. Please leave a comment below if you want to get in touch with her.